is a synonym for authentic interpretation of popular music of the swing era, i.e. 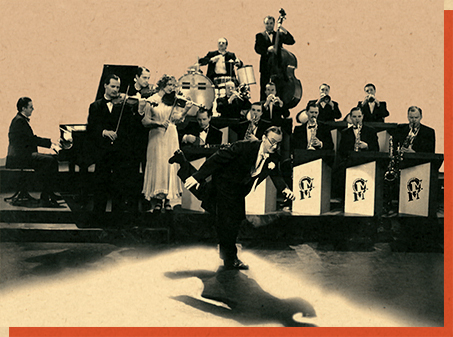 music dating back to the beginning of the 1930s to swing’s heights in early 1940s. Their variegated repertory includes a broad spectrum of attractive tunes, sweet and hot, ranging from Hollywood musicals to big bands’ top swing numbers. A concert is more than that; it is a show designed in the minutest detail to emulate the typical manners of those times, complete with the costumes and hairdos, and rounded off by overall direction of the performance. The musicians’ thoroughly jazzy style is compounded by their sense of humour, show, and understanding. The band's enthrallings sound and tempo support the soloist: Ondrej Havelka, a singer, speaker and dancer.